Review: Hop, skip and win! Linja is one of the older abstract games from Steffen Spiele. First published in 2003, it's an abstract race game somewhat reminiscent of a diceless backgammon in which two players attempt to race their pieces towards their home space. 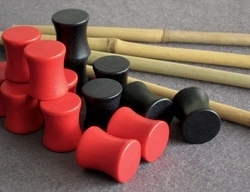 The game comes with nice wooden components, including 7 bamboo sticks which are used to mark the play area and 12 chunky hour-glass shaped wooden pieces for each player in red and black. At the start of the game, the 7 sticks are laid parallel to one another to form 6 spaces with two open spaces at each end forming the home spaces. 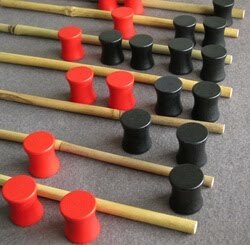 Players place half their pieces in the opponent's home space and lay each of the six remaining in one of the rows between pairs of sticks. During the game, the players will attempt to get all of their pieces across the board and to their home space. The game ends as soon as the two groups of pieces have completely passed each other (ie once there is at least one stick which completely divides red pieces from black) At the end of the game, players score 5 points for each piece that reached their home space, and 3, 2 or 1 points respectively for pieces in the three rows nearest it. Pieces elsewhere on the board score nothing. Each turn, the players perform a two-step move. For the first step, they move one of their pieces one space closer to their home space and count the pieces from either player that were already in the destination space. They then choose one of their pieces (possibly the one that just moved one space) and move it as many spaces as the pieces counted in the first step. Pieces can only be moved forwards towards their home space. There are several minor constraints on these moves: the second move cannot be shared among multiple pieces, extra steps beyond the home space are lost, and no row can have more than 6 pieces in it. If a piece is moved to the home space in the first step, the second step will be only 1 step, regardless of how many pieces are in the home space. If a piece is moved into an empty row on the first step, then there is no second step. The final rule gives the players a chance to play double moves. If their second step moves a piece to an empty row, the player plays another full turn (with both steps), although it is not possible to gain an second free turn. As Linja is basically a race game, getting these extra turns (or preventing your opponent from getting them) is crucial. As the game is a race to get their pieces home, both players are forced to try to make and set up the most efficient moves possible. To move every piece to the home space requires 63 movements, although some extras may be wasted by jumping beyond the home space. Most of the time, moving most efficiently means making the best use of very full rows to make large following moves, although a nearly-full row can be dangerously useful to your opponent. Double-moves can be really useful, but they usually only appear a lot towards the end of the game when more pieces have been moved off the board. Even if there aren't any empty rows, one of your pieces on its own can be moved to create an empty space to jump into. It's a struggle to avoid giving up too many opportunities in the mid-game, even though this can force you to spread your pieces out, leaving you forced to rely on the other player's pieces to make large jumps. Another interesting aspect is the end-game condition. Since the end of the game requires a complete pieces crossing, a player who needs the game to continue for longer is free to leave one of their pieces in the opponent's home row while all their other scattered to safety. It's unlikely that this piece will ever score, but seizing control of the game length can be valuable, since it can be ended whenever the controlling player has managed to pull ahead in points. (I once lost a game by 2 points to such a play. Linja is a fast-playing game. We've not seen games last much over 15 minutes once people get a feeling for how to construct structures that let them move their pieces quickly. It's mostly easy to explain apart from the handful of rules corners and an easily portable cafe-table game you can get set up in a couple of minutes. Light, but appealing.